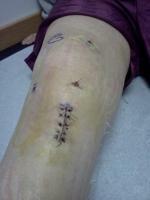 This was my second acl surgery. Both were hamstring grafts. The first was 10 years ago, I was 18 and I don't remember much. I don't remember how long it was till I could walk again, how long I used crutches for, how long the pain lasted, or what kind of rehab I did. I do know that within a year, and every year since, the knee was great and responded well to every sport I played. I was never the same, but close. I am now into my 14th day after surgery on my other acl, and things don't seem to be going well. It is quite painful all the time, especially when I am standing up. I can't walk yet and are still using crutches. Sleeping is horrible and scarce. I am not on any medication, but since I went off the Tramacet 5 days ago, I don't eat much, I don't sleep much, and the pain is fairly constant. I notice lots of pain in the knee and at the main opening cut. I will speak to my surgeon in the next day or so if things don't dramatically improve. Any info of similar experiences would be very welcome. Again, this may be the norm for some people, and I stress that when my other acl was reconstructed, I did get back to normal functioning.